Pigmentation happens primarily due to the melanin that is produced by melonocytes in the skin, in response to UV exposure. Some skin types are more prone to producing patches of pigmentation in the form of freckles or sun/age spots. 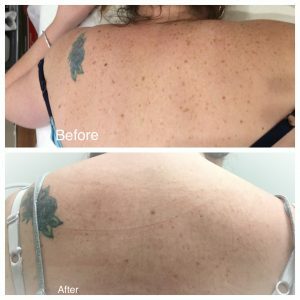 After the light from the IPL is absorbed by the brown pigmented lesions, the heat energy shatters the pigment and is removed either by absorption through the body’s lymphatic system or is lifted to the top layers of the skin where the pigment crusts and flakes off. The number one cause of premature ageing of the skin is sun damage from UV exposure. It results in increased collagen breakdown. Also, excess melanin is stimulated, resulting in more of the visible pigmentation on the skin in the form of freckles, age spots and sunspots. Wearing a minimum SPF 30+ when outdoors will greatly reduce this visible sign of ageing but most of us have at least one or more sunspot or discolouration we would love to get rid of. Lose It With Laser perform skin pigmentation treatments at our Box Hill clinic that can clear affected skin. We use medical grade IPL machines that effectively treats the pigmentation to remove it permanently. IPL treatments for pigmentation involves the use of an intense beam of broad spectrum light, as opposed to lasers that operate using one specific wavelength. The light is absorbed by the pigments found in the dermis, the lower layer of the skin. Pigments can be the brown colour in freckles, the haemoglobin in broken capillaries or the pigment in the follicles in the case of hair removal. The light energy is converted to heat to a critical temperature which “tricks” the lower level of the skin into thinking it has suffered an injury and responds by producing collagen. The pigments are also dispersed and the body either absorbs them or removes them via the lymphatic system. The pigments in sunspots go darker and sometimes almost black before micro crusting and falling off from between 7-28 days later. Skin pigmentation treatment can be performed on the face, hands and the body. 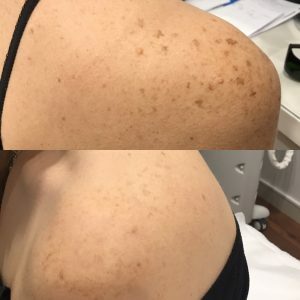 The darker the freckles/sun spots, the better the visible results from the first treatment. Lighter pigmentation is located deeper in the dermis so requires more treatment. 1-4 treatments may be required with one month between treatments at our clinic in Box Hill. A booking will also be made for a follow up consultation approximately one week after the IPL treatment for pigmentation. At no extra cost, a light peel treatment will be performed to further enhance the results, revealing a fresher, glowing skin. (Value of peel treatment being $60). Do you want to remove any undesirable pigmentation that stands out on your skin? Contact Lose It With Laser today on 0432 162 862 today to book an appointment for our IPL treatment for pigmentation.